To tennis fans, July means Wimbledon – to me, Wimbledon means strawberries and cream. 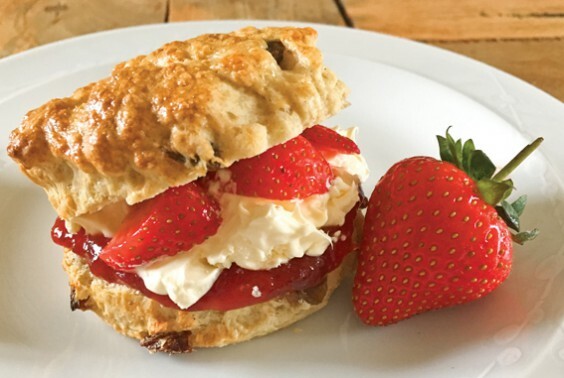 And what better way to celebrate British strawberries being in season than with a classic fruit scone? I serve them filled with strawberry conserve, clotted cream and fresh strawberries, and then sandwiched back together; that way, you can eat them with one hand, should your other hand be holding a glass of Pimm’s. These are quick to make and are best eaten fresh from the oven, still slightly warm. 1) Heat your oven to 220C / 200C fan / Gas 7. Lightly grease a baking sheet. 2) Sieve the flour, bicarb, cream of tartar and sugar into your mixing bowl. 3) Rub in the fats with your fingers, then add the sultanas and milk and mix together briefly. 4) On a floured surface, knead the dough lightly, then roll out to 3cm thickness. 5) Stamp the scones out, using a 6.5cm cutter and arrange close together on the baking sheet. 6) Brush the tops with egg wash, then bake for 10 mins. Cool slightly on a rack. 7) Split the scones and fill with your choice of conserve, cream and strawberries. Enjoy!